We hope you like your water extra salty! A new report released by the Canadian-based United Nations University’s Institute for Water, Environment and Health (UNU-INWEH) found that desalination plants across the globe are discharging toxic levels of brine on an annual basis. The plants—many of which are based in the Middle East and North Africa, where fresh water sources are scarce—produce enough fresh water to equal about half the average flow over Niagara Falls every single day. While they’re quenching the thirst of many who’d otherwise be susceptible to dehydration, desalination plants may be causing more harm than good. For every liter of fresh, drinkable water a desalination plant produces, 2 liters of brine are discharged. While we typically think of brine as the stuff pickles are kept in, the term also refers to the wastewater from desalination plants. Along with a high concentration of salts, it can also contain heavy metals and leftover pretreatment and cleaning chemicals. This week, we’re breaking down brine and detailing the detrimental effects of desalination plants on our greatest global resource: water. Then, we’ll discuss how scientists suggest we fix the issue before it gets worse. Earlier this week, news sources picked up the study by UNU-INWEH which will be published in the March 20 volume of Science of The Total Environment, a peer-reviewed journal covering a wide range of environmental science. Researchers for the study found that brine is being produced at a far greater rate than previously estimated. In fact, the toxic concentration is being produced at a rate of 141.5 million cubic meters per day—50% greater than previous estimates. Annually, that’s enough brine to flood Florida with a foot of the salty solution. Because of the higher concentration of salts and chemicals in brine, it can have negative effects on oceanic ecosystems when it is dumped back in. Brine from treated seawater is naturally heavier than the seawater it came from due to the higher concentration of salts and metals, so it sinks to the bottom of a body of water when reintroduced. It also lowers oxygen levels in the seawater it’s dumped into, impacting creatures like shellfish, crabs and shrimp who live on the seabed. And our oceans are only half the battle. While desalination plants which tap brackish water (water with higher salinity than water but not as high as seawater) are more efficient, they still contribute to the issue of excess brine production. Unfortunately, the countries responsible for the most brine production are only doing so because their access to freshwater is so limited. We’ve written about this a few times before, but certain areas of the world are more likely to experience water scarcity than the U.S. The weather, global warming, inconsistent runoff patterns and plenty of other factors are all responsible for water scarcity—especially in the Middle East and Northern Africa, two regions which produce the majority of the world’s brine. Scientists provided a few alternative uses for brine which could help desalination plants be more responsible with its disposal. “Using saline drainage water offers potential commercial, social and environmental gains. Reject brine has been used for aquaculture…it has also been successfully used to cultivate the dietary supplement Spirulina, and to irrigate forage shrubs and crops,” the authors state. Brine often contains a small concentration of precious elements. Uranium, for example, is often found in brine and there’s opportunity for companies to harvest. More opportunities lie in the salt itself. It would be fairly simple to evaporate the water in brine to harvest the salts and use them for things like table salt or even salt for road deicing. Study authors also suggest using brine in aquaculture, irrigation (for salt-tolerant species) or electricity generation instead of using water bodies for its disposal. 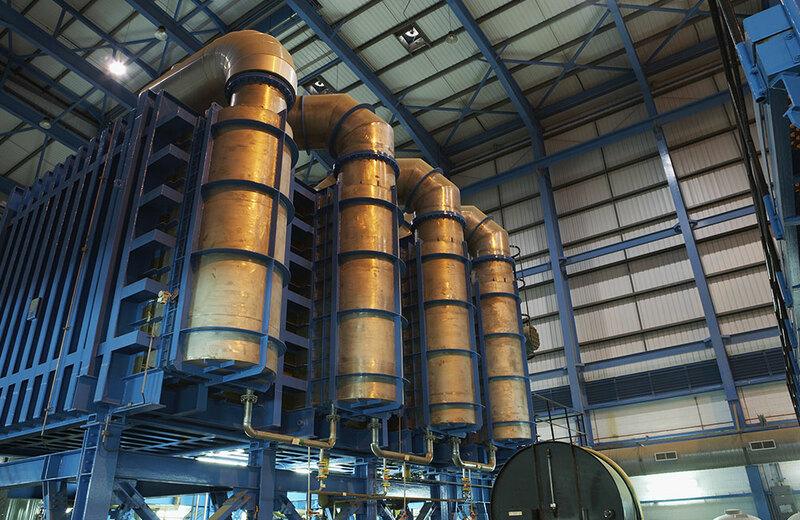 There are plenty of opportunities for desalination plants to reduce their brine waste and help keep water bodies safe from the toxic materials it contains. If you want to treat your water to reduce the concentration of contaminants you encounter when showering, cooking and drinking, talk to Quality Water Services about installing a reverse osmosis system in your home today.